Timothy "Tim" Theodore Duncan (born April 25, 1976) is a former professional basketball player from the US Virgin Islands. 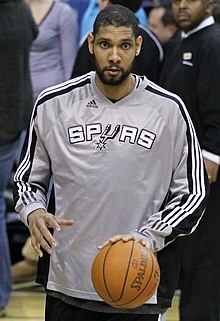 He played the power forward and center for the San Antonio Spurs of the National Basketball Association (NBA) his entire 19 year career. Duncan was a swimmer when he was young. In 1989, Hurricane Hugo destroyed the pool he used to practice swimming, and his mother died a year later. Duncan gave up on swimming after this and began playing basketball. ↑ "CNN/SI - 1999 NBA Playoffs - Western Conference - Duncan's roots in St. Croix have grown large - Tuesday June 29, 1999 04:11 PM". sportsillustrated.cnn.com. Retrieved November 8, 2010. ↑ "NBA.com: Most Valuable Player". nba.com. Retrieved November 8, 2010. ↑ "Tim Duncan Biography". espn.go.com. Retrieved January 29, 2014. ↑ "TIM DUNCAN ANNOUNCES RETIREMENT". NBA.com. July 11, 2016. Retrieved July 11, 2016. This page was last changed on 6 March 2017, at 02:18.